Did you know that Walt Disney was nearly bankrupt while he was shopping his “Steamboat Willie” cartoon featuring Mickey Mouse? Because a sound cartoon was entirely new, distributors and theaters were hesitant to sign onto the new “Steamboat Willie” sound cartoon. Existing companies, such as RCA, had an interest installing the new product while they figured it out themselves. His sound cartoons were extremely costly to produce and was barely breaking even, despite getting $40,000 in fees and rentals (a considerable sum in the 1920s). 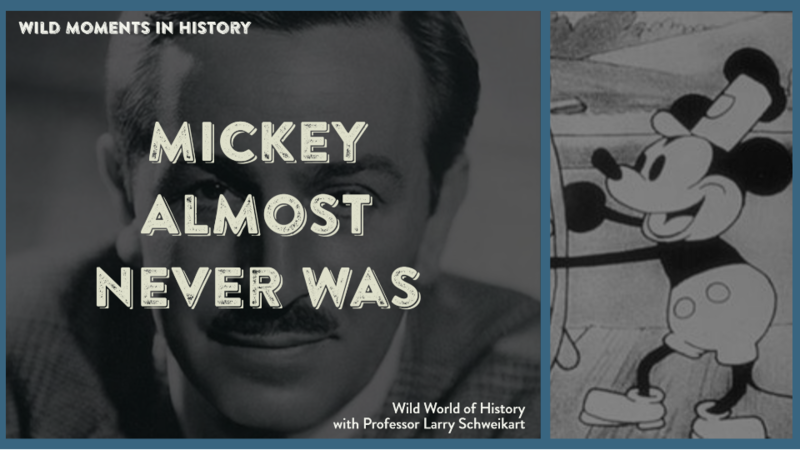 Even as “Steamboat Willie” brought in remarkable grosses, the costs of the recording studio and the wages of his artists forced Walt to take out loans to survive. Only when he showed his cartoon to Frank Capra (who would become a legendary director), who in turn insisted the head of Columbia Studios, Harry Cohn, see it. Cohn was impressed. It wasn’t the first time Walt Disney had been in financial trouble. Earlier in his career, he had to move from location to location with his artists as he skipped out on rent. Nor would it be the last time he was cash strapped. After a peak in the 1930s with “Snow White and the Seven Dwarfs,” Disney’s animations began to flag in popularity until “Bambi” and “Fantasia” brought in new revenues. Still, the cost of Disney products was overwhelming. Finally, in 1940, Roy Disney told Walt there was no choice but to sell stock and make Disney public. Ironically, Disney may have been saved by World War II, wherein the U.S. government needed Disney’s studio to turn out morale-building cartoons and training videos. The company’s first contract for films on aircraft and warship identification was for $90,000 and soon Walt’s characters were enlisted to support everything from paying taxes to holding the appropriate attitudes toward the Axis powers. After the war, Walt had one more tremendous challenge when it came to the company’s finances: his dream, “DisneyLand.” Roy considered it too risky for even him to support, and Walt sold his insurance policy to come up with cash. He also convinced ABC television to broadcast one episode a week from his park. Today, no financial analysts would even dream of Disney being insolvent, but for much of his life and career, it was a normal state of affairs for Walt Disney.